Timing was critical to catch this image of November 3rd's solar eclipse. 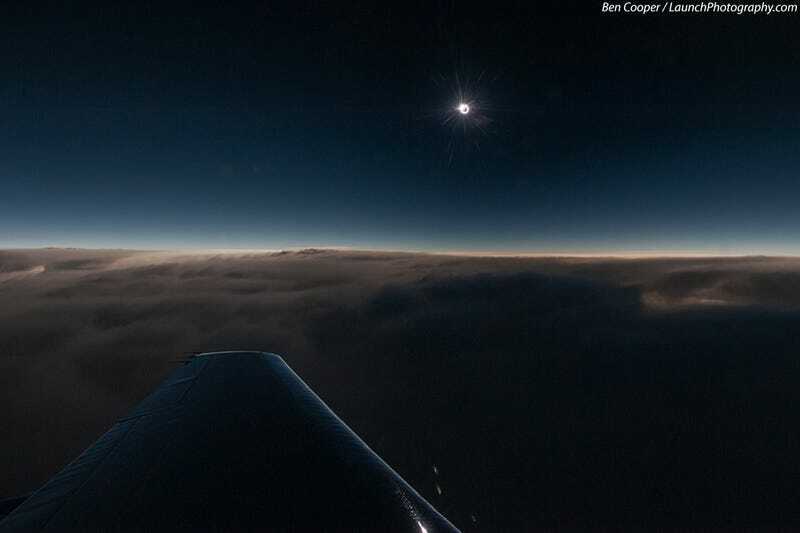 But flying at 44,000 feet, intrepid eclipse chasers on a chartered jet traveling 500 miles per hour managed to intercept the the Moon's shadow. The remarkable flight made a perpendicular crossing of the central shadow track. Darkening the skies beyond the wing tip at that moment, the Moon's shadow was moving at some 8,000 miles per hour across the Atlantic Ocean, 600 miles southeast of Bermuda. After only an instant of totality, this snapshot captured the lunar disk in silhouette. Rays of sunlight shining past peaks and valleys along the lunar limb created the fleeting appearance of a glistening diamond ring.